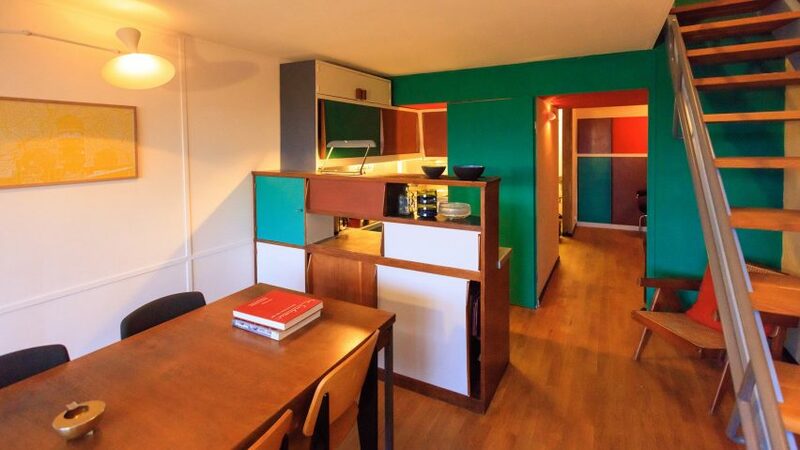 An apartment in Berlin's Unité d'Habitation has been refurbished by German-American architect Philipp Mohr to Le Corbusier's original plans. Mohr, who had been a fan of the influential architect since he attended a retrospective exhibition as a teenager in the 1980s, purchased the apartment in 2016 with the intention of refurbishing and selling it. When the Brutalist Unité d'Habitation building in Berlin was constructed in 1958, its interior plan was drastically altered following a disagreement between Le Corbusier and the local planning authorities. When he bought the apartment, the interior bore little resemblance to the way Le Corbusier intended it, so the architect set himself the goal of refurbishing it to the architect's original design. "The way I found the apartment was the original interior from 1958, with the original stair, bathroom and layout," Mohr told Dezeen. "It was all entirely white and looked more like a prison, or the typical 1980s German social housing, than anything Corbusier had ever designed." Mohr's research at the Fondation Le Corbusier and the Cité de l'Architecture et du Patrimoine in Paris helped him establish that the building's interior was designed to be identical to the original Unité d'Habitation in Marseilles. "My realisation was that there had been plans for the Berlin apartments and that the interior was not drawn by Le Corbusier or his designers at all," Mohr explained. "German architects from Berlin were actually in charge of drawing their own cheaper interiors that conformed with planning criteria within the shell of Le Corbusier's building," he continued. "The result was not proportionate anymore, so the character, mood and quality and function of the interiors was entirely lost." The Unité d'Habitation in Marseilles is regarded as one of the most influential Brutalist buildings of all time. Also known as the Cité radieuse, it was developed as a new typology for affordable housing that offered generously proportioned dual-aspect living spaces surrounded by communal parkland. Mohr's design for the apartment replicates the interior from the Marseilles building, and is also informed by a restored studio apartment constructed as a museum in Paris. Having completely gutted the interior, Mohr began the transformation by lowering the ceiling height and moving walls to reproduce the intended layout and proportions. The existing stairs and kitchen were removed and replaced with original versions that were purchased at an auction, along with new parts that were rebuilt based on the original plans. Mohr sourced furniture and lighting by Le Corbusier, and some of his contemporaries, including his cousin Pierre Jeanneret, Jean Prouvé and Charlotte Perriand, to complete the interior. Although not authentic to the original apartment, the furniture all relates to the period in which Le Corbusier developed the plans. The colour scheme was carefully chosen based on research into Le Corbusier's writings about colour theory. Some of the paint colours used were developed by Le Corbusier himself and are now available from Swiss company Les Couleurs Suisse. "The colours are timeless and very soothing and inviting," Mohr claimed. "The use of wood and natural finishes is comfortable and homely. The proportions are pleasing and the relationship to views and light is positive and uplifting." Le Corbusier's famous book on colour theory has inspired a range of lacquered parquet flooring produced by Secret d'Atelier and a collection of tiles manufactured by Gigacer in a range of grey tones and primary colours. Mohr has already found a buyer for apartment number 258, which was sold fully furnished with all of the pieces he had sourced, many of which are museum-quality originals. Speaking about his motivations for renovating the dwelling and selling it on, Mohr explained: "As a designer I never have any influence on what clients will do with the apartment but the hope is that this project will evolve." "My hope is that the apartment will inspire the next owners to invite friends and show it to other people and that they might eventually sell or rent it to someone else who is interested in this experience." In 2016 heritage body UNESCO added 17 of Le Corbusier's projects, including the Unité d'Habitation to its list of internationally significant architecture sites. Also included on he list were the Villa Savoye near Paris, the government building in the Indian city of Chandigarh, and a house in Argentina, with a tree growing through it. Photography is by Didier Gaillard-Hohlweg.